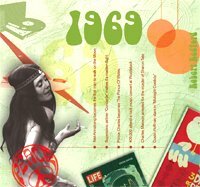 1969 Top 20 Hits.. We know it's hard to find that memorable 1969 anniversary or 1969 birthday gift which is why we are offering this CD/Card offering the music of 1969! When they listen to these 1969 top hits, it'll bring it all back for them! Our song list includes: A Boy Named Sue (Johnny Cash), Aquarius/Let The Sunshine In (Fifth Dimension), Bringing On Back The Good Times (The Love Affair), Come Back And Shake Me (Clodagh Rodgers), Cupid (Johnny Nash), Durham Town (Roger Whittaker), Everybody�s Talkin� (Nilsson), Everyday People (Sly & The Family Stone), Happy Heart (Andy Williams), I Threw It All Away (Bob Dylan), I�d Rather Go Blind (Chicken Shack), I�m Gonna Make You Mine (LaBelle), In The Ghetto (Elivs Presley), In The Year 2525 (Zager & Evans), Seventh Son (Georgie Fame), Soul Deep (Box Tops), The Boxer (Simon & Garfunkel), To Love Somebody (Nina Simone), When Two Worlds Collide (Jim Reeves), You�ve Made Me So Very Happy (Blood, Sweat & Tears). Twenty 1969 songs in all! See also our other 1969 gifts.